The Philippines’ IT-Business Process Management (BPM) industry is the curious outlier in the country’s business landscape – the family overachiever, who, in the last 20 years, has generated over a million direct jobs and sent over $20 billion in annual revenues pouring into the national coffers. Understandably, its various stakeholders have been constantly mapping its growth trajectory, always trying to figure out how to sustain the unbelievable momentum. But organizations and industries are complicated, and so are economies and technologies – twin forces that wrap this industry around in a fickle ecosystem that is constantly drawn and redrawn. The current roadmap that has been guiding its path for the past six years is ending this year and a new framework has been crafted for a new one. Benedict Hernandez, chairman, executive committee, Information and Technology and Business Process Association of the Philippines (IBPAP), said that when the first roadmap was crafted in 2005 (called Roadmap 2010), the ambition was to gain an “unfair” share of the world’s outsourcing market and to go from obscurity to becoming a globally recognized top destination for IT-BPO services. “We are obscure no more,” he said, adding that the succeeding roadmap (Roadmap 2016) has aimed for continued high market growth and spread the economic benefit to the countryside. In Roadmap 2022, he said the industry is aiming for a more diversified broad-based growth across services, market served and service delivery locations. More importantly, another one million higher value direct jobs over the next six years. It is, however, a very different landscape altogether. Lito Tayag, vice chair, IBPAP, said there will actually be five different roadmaps – each represented by the different sectors of the industry – contact centers, healthcare management, IT, animation and gaming, GICs and – plus the bigger roadmap for the whole industry. All told, taking into consideration the intricate bits of the global digital economy packed by fragile nuances of technology shifts and a changing local landscape, it is an industry in search of the next value proposition. Nitin Bhat, partner at Frost & Sullivan for the Asia-Pacific Region and country head for Singapore, said that the global IT-BPM industry is still expected to grow at a compound annual growth rate of six percent between 2015-2022. In the next six years, an additional $85 billion will be generated by the industry. The Philippines, he said, has been growing at 2.5 times the global growth rate during this period, but the nature of the IT-BPM industry is changing. The analyst said he sees the format of growth going to be different from what it was years back. “If the initial gain was driven cost arbitrage, the next gain would be driven by value-added, in terms of the how processes can be done better in the Philippines. What is the value that we can add as a country?” he asked. The biggest challenge, according to Frost & Sullivan, is the impact of technology in the industry. Businesses are themselves transforming, driven by big data, analytics, Internet of Things (IoT), cloud computing and increasingly being driven by expanded computing power and storage capacity. “It means lots of business processes are getting digitized so there is an opportunity for the Philippines to participate in the digitization process both from an outsourcing perspective and actually digitizing process,” Bhat said. Automation and artificial intelligence loom in the horizon as probably the technologies that will have the most impact in the industry. This year alone, the largest technology companies have announced in their respective developer and partner conferences that they are betting big time on bots or internet robots. And there could be a compelling reason why. In a world that is getting more virtual and augmented, chat bots or computer programs that run automatically without human intervention, have the potential to converse or talk directly with thousands of consumers simultaneously. Understandably, the first companies that deployed the first chatbots are those involved in services. Now, you don’t have to call a number to book tickets, hotel rooms or to order food or flowers, and make routine inquiries. Bhat said the impact of technologies like this would be three-fold: automation of certain business processes could mean that some jobs may be automated; robotics will have a greater impact on the industry than previously thought of; and more organizations will be exploring newer business models, including business process-as-a-service. Rather than get scared of the technology, he said the industry should embrace technology. “The bigger task is to upskill the talent base of the current people employed in the industry as well as the people getting into the industry to ensure that the industry as whole will remain competitive,” he stressed. In the last two decades, the industry has always worked through a collaborative model, which means that it has worked closely with the academe, the government and the private sector to move things forward. “Our strong community is a key competitive advantage and it has made us successful in attaining our success with our roadmaps in the past,” Hernandez said. The government has been a close ally of the industry in crafting incentives to make it easier for BPO firms to set up shop in the country, providing tax and other financial incentives, and creating a conducive environment for business to thrive in the so-called “next wave cities” to promote inclusive growth. Catherine Ileto, IBPAP trustee, said that as the industry sees it, the only genuine way to continue promoting inclusive growth in the next years is countryside development. A collaborative model — no red tape, private sector involvement, LGU support, among others – is still going to be the best approach. The IT-BPM Roadmap 2022 is now being crafted against a backdrop of a new political landscape – a new President has just been sworn into office, which also coincided with the creation of a new Department of Information and Communications Technology (DICT), which was given the mandate to craft plans and policies that would drive the national ICT development agenda. “The task is daunting, it overwhelms,” said newly appointed DICT Secretary Rodolfo Salalima at the media launch of the roadmap, which was also his first public speaking engagement and first media interview since assumption into office on July 1. 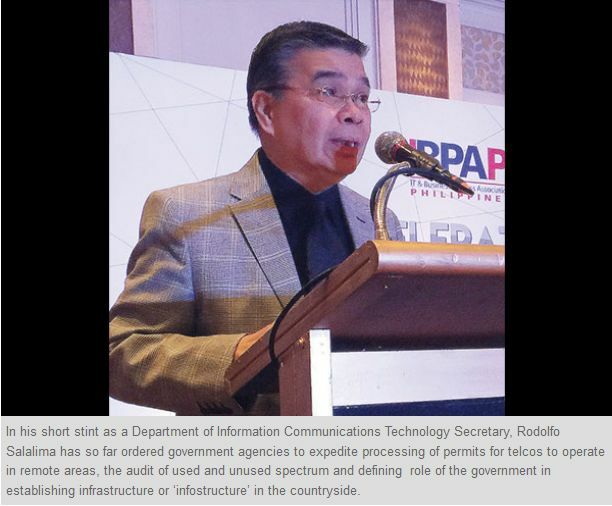 In his short stint as a government official, Salalima has so far ordered government agencies to expedite processing of permits for telcos to operate in remote areas, the audit of used and unused radio frequencies and the possible reassigning of spectra to telcos with the capability to maximize their use, and the role of the government in establishing infrastructure or “infostructure’ in the countryside. The goal is to immediately address the persistent problem of slow internet speed that has hounded not just the IT-BPM industry but practically all industries and all sectors of Philippine society. The new DICT chief also sees the need to for inter- or intra- government connectivity for the fast and efficient exchange of data that could be very useful to all. “The role of government is to enable the growth of this sunshine industry and support the vision of Roadmap 2022. This is one industry that can truly promote inclusive growth across the nation, create a whole new middle class in the poorest of communities and generate jobs for millions of Filipinos,” he ended.